You may have known the frustration of dealing with a clogged drain in the past. You try everything from boiling water to drain cleaners, but nothing seems to help. Ignoring the problem is out of the question – one major plumbing disaster would produce countless repair bills and turn into a financial catastrophe. You want to hire a professional plumber, but you don’t know who to trust. The last thing you need is for an inexperienced handyman to show up and make a mess of your house, only to charge you by the hour. 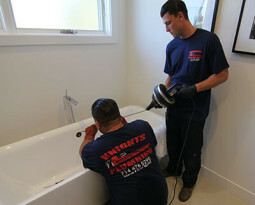 Knight’s Plumbing employs reliable, professional plumbers with years of experience unclogging drains. Not only will they provide a proper diagnosis within minutes of arriving, they will employ state-of-the-art tools to reach the clog and clear it, without damaging your house or your plumbing infrastructure. The professionals at Knights pride themselves on being the best at what they do, and will give you their best effort, as if they were fixing their own house! Knight’s Plumbing technicians are trained to assess the source of a clog using modern video technology, tailor-made for descending deep into the sewer lines of your home or place of business. With a proper diagnosis, our certified and bonded plumbers will save you valuable time and money. By viewing the interior of your own piping on our monitor, you can be confident that we know what we are talking about. You will understand why we need to perform the necessary procedure to your system, because you will see it for yourself. Once you are confident that our professionals are on the right track, you can give us the green light to begin work. That’s when our plumbers get down to business. Hydro-Jetting is a process that requires a special, flexible hose, with a high-powered nozzle, that can reach all the way down your pipe to the source of the problem. By examining your pipes, our plumbers will be able to determine the right amount of pressure to apply to clear the clog, without causing damage to your home or office, and without creating a backup and making a mess. Once the hose is in place, a blast of water at very high pressure will force the clogging material forward, while also knocking loose debris caked onto the sides of your pipes. The loose material will shoot forward, into larger pipes until it reaches the municipal line. Hydro-Jetting is an extremely practical way to deal with most stubborn clogs. This tool can remove grease, hair, dirt, mud, and countless other kinds of debris. But it must be done by experts; such a tool can damage your home or place of business if in the wrong hands. 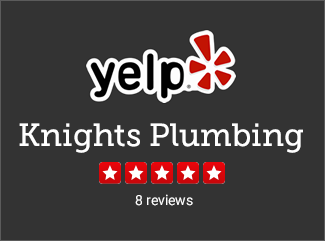 You definitely want the experience of Knight’s Plumbing on your side! In some cases, a pipe can be breached by the roots of an invading plant. In such case, roots can get inside of the pipe, catching debris and particles as they come down the pipe, thus forming a block. To clear roots, Knight’s Plumbing uses a special device called a rooter, which, like the Hydro-Jet, descends into your system and reach the roots. Once there, a special rotating blade and motor will trim the roots. After cleaning the roots, Knight’s Plumbing will be able to work with you to come up with a long-term solution to the root problem. When roots encroach on a sewer system, they can damage pipes to the point where they need to be replaced. 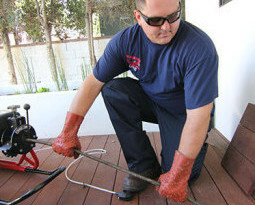 In such case, you will want a plumber capable of locating the point where the roots are breaching the pipe, who can help you identify the plant causing the problem. You will want that plumber to be capable of digging up and replacing the pipe at minimal cost and inconvenience. Knight’s Plumbing is not only a one stop shop for all these services, they can also scout the rest of your lines, to determine whether the potential exists for further breaches. Sometimes, too much pressure will cause a pipe to break. On other occasions, the material your pipe is made from will become corroded and lose its integrity. When a breach occurs, the dirt and rocks surrounding the pipe will collapse into it, partially or completely blocking flow through it. In such case, you will definitely want to give us a call! First and foremost, a proper diagnosis will save you considerable time. The last thing you want is an amateur spending hours trying to snake a drain that will never come unclogged! Although your situation is desperate, knowing that you have a breach will help you, because at least you will be able to avoid damaging your home by using lines that rely on the breached pipe. Then, when it is convenient for you, Knight’s Plumbing can provide the necessary labor and materials to replace the damaged line. Knight’s Plumbing understands that plumbing expenses are never planned, nor convenient. We have established our good name in Orange County by being consistent, reliable and have the lowest rates. Because we are good at what we do, we can offer one low, flat rate for our service, and we will always stand behind our work. We are confident that we can help you, no matter what the problem is! Our plumbers are well-groomed, well-dressed, friendly, and easy to talk to. If your drain needs to be cleared, we are available 24 hours a day, any day. We are located in the heart of Orange County, and can get to you promptly, with all the right tools, and the attitude one expects of a professional. We enjoy our job, and when we are finished, you will remember us by the courtesy we showed you, and by the quality of the service we have provided.